Getting a lot of catch up work done for insects and scholarship committee today, so I was at my desk all day, which means I got to watch some falcon cam! The South Loop Duo is doing great. I got a call from someone worried because she hadn’t seen a chick on the feed for hours. I told her that I would bet money that the chicks were sleeping directly under the camera and, thankfully, while I was on the phone with her, one chick popped into view. Helen came in not long after to feed her two, so our caller was relieved. This will happen more and more as the chicks get older and more mobile, so don’t worry if you don’t see them! The Evanston Four are getting big. I think we will be banding them sometime next week, though I probably won’t go up for that, since there will be plenty of hands on deck and thanks to the Evanston monitors, we always had adult ID’s in early season. I got to see Squawker come into the nest with food. He jumped down, looking ready to feed his chicks, when Nona came in and sent him on his way so that she could do the feeding. I have a two composites posted on Flickr. Two of the five Savanna eggs appear to have hatched. The Savanna cam has been a bit difficult this year as it times out frequently and sometimes isn’t up for days. 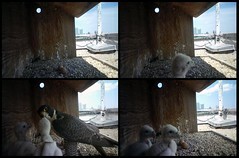 Today, though, I finally got a look at the two chicks and even witnessed a feeding. They look great too! The composite is up on Flickr. Waukegan also appears to have two. One of the adults came in to feed them as I was watching and then laid down next to them to nap a bit. Being a parent is hard work! The composite is up on Flickr. ~ by Steph on May 20, 2013.